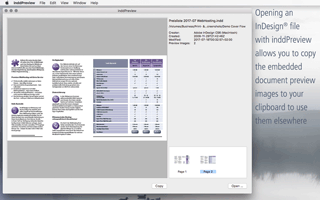 New in version 2.3: support for InDesign® snippets and InCopy® documents. 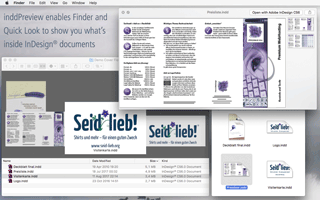 inddPreview enables Finder and Quick Look to show preview images of InDesign® documents. You know that problem: searching for an InDesign® document, not remembering its name but how it looked like. Opening one file after the other in InDesign® – well, that’s the wrong document – closing – next try – also wrong – next – etc. Wouldn’t it be nice if we could see what’s inside a file already in Finder – just like we can do with image files, PDF’s and many other file types? inddPreview makes this possible! 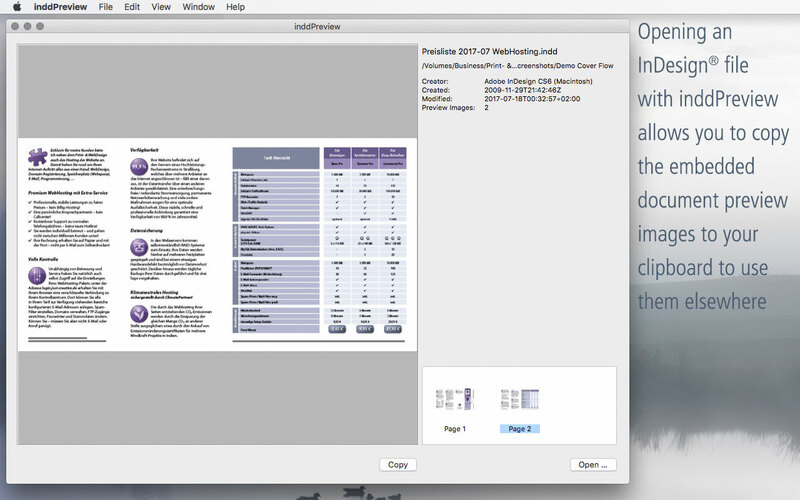 inddPreview enables Finder to show these – usually hidden – preview images which are embedded in Adobe® InDesign® documents. No need to run the app – it’s sufficient to have inddPreview installed. And all of a sudden Finder shows nice little preview images instead of featureless file type icons. By pressing the space bar a Quick Look window opens letting you have a more detailed insight. The main goal of inddPreview is to provide this Quick Look plugin to the system. In addition, you can use the app and open an InDesign® file with it to copy those preview images to your clipboard to use them elsewhere. inddPreview supports all InDesign® documents (.indd), template files (.indt), snippets (.idms) and InCopy® documents (.icml) of versions from CS2 up to current version CC2018. 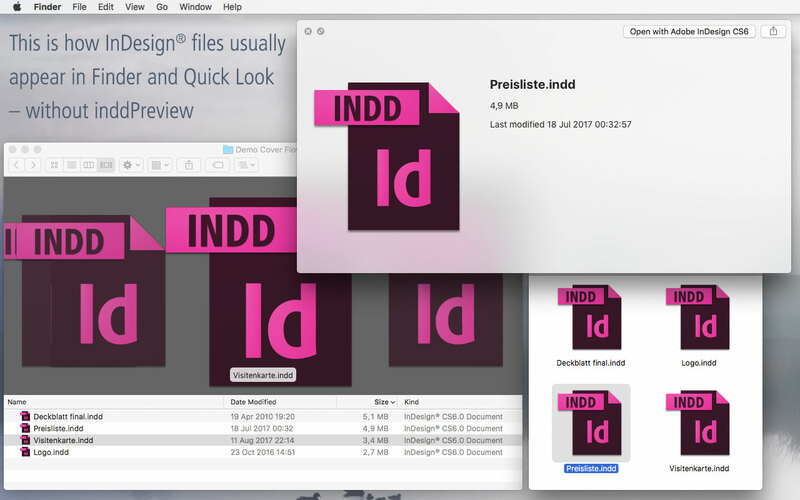 Precondition is to embed preview images when saving files with InDesign®. Whether and how many thumbnail pictures will be embedded and of what size they are, can be configured within the preferences of InDesign®. inddPreview requires OS X 10.8 Snow Leopard or later.